Custom Image Search is a free service by MediaFocus to provide your business with an instant image library with no up-front cost. If you have an online printing business, produce greeting or business cards, promotional materials or anything else that licenses images – then MediaFocus's Custom Image Search is what you need. 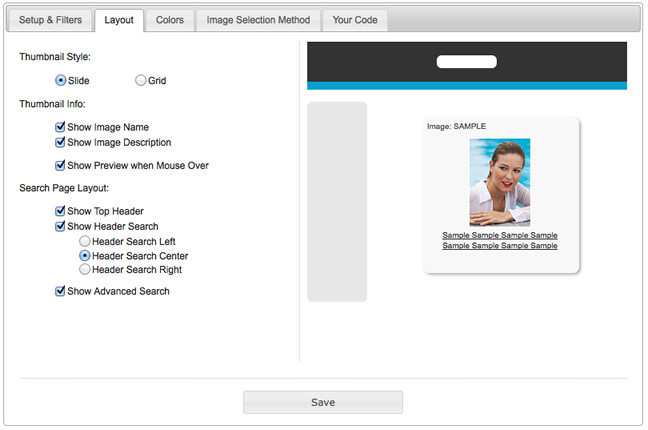 With Custom Search, you can make our entire image library available and searchable by your users and on your site. This will drastically reduce image licensing costs for your business by allowing you to only license images that you will actually use. Powerful filtering and customization options will present a search page that blends in with your site's color scheme and display unbranded preview images to your customers. 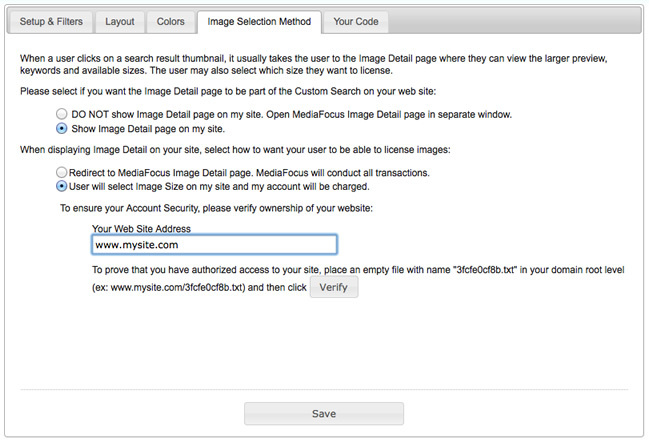 Optional account integration will further allow you to automatically license images your users chose and have it credited against your MediaFocus Image Subscription. Image 1: Link location for "my account"
You are able to set up a pre-filter for your Custom Search. For example, if your business works exclusively with vectors, you can configure your pre-filter to exclude non-vector photos and images. The same concept applies to Shape and Size. These pre-filters are not known by your users and cannot be overridden, except where noted below. Users are not allowed to select other sizes - default - This restricts the user only to the exact size you have chosen in your pre-filter. Users may select other sizes smaller than above - This allows the user to select any other image size smaller than that in your pre-filter and up to the size you have set. Thumbnail Style - Choose from the "photo slide" style or the more modern grid lines layout of the thumbnail images for search results. Thumbnail Info - Select what image information you want to show for each thumbnail. Less information will present with a more cleaner look. Search Page Layout - Select which on page search elements you want displayed. Hiding the Top Header will give more room for the thumbnails. Advanced Search allows the user to refine their search by Type, Shape, Size and Color. However, only those options which are not restricted by your pre-filter will be available. Background - This is the page's main background color where the thumbnails will be displayed against and is also the background color for the image detail page. Header - This is the background color for the Top Header section where the main search box is displayed. Header Border - This is the border bar just underneath the Top Header, separating the header from the main thumbnail section below it. Advanced Search - This is the background color for the Advanced Search panel on the left. After setting up the pre-filters and look and feel of your Custom Image Search comes the most important part – site integration. 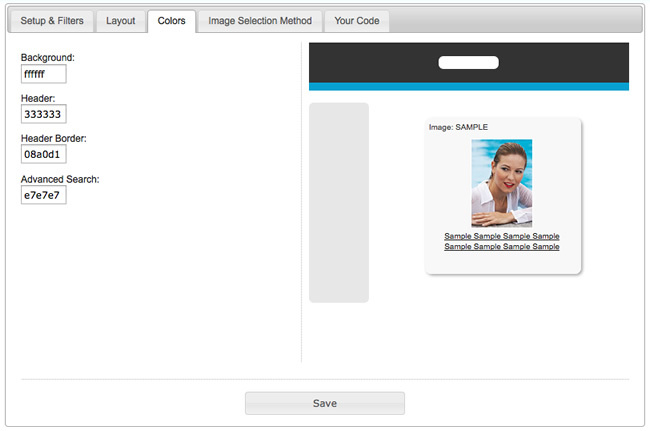 Here, you will select what will actually happen when a user on your site selects an image to use. There are many different options, each offering an increasing level of integration to make the image shopping seamless for your visitors. However, full integration would require some minor development on your part. Note that not all options will be available at all times as some options are dependent on the selection made before it. DO NOT show Image Detail page on my site. Open MediaFocus Image Detail page in separate window. This is the simplest option. Here, when a user on your site clicks on an image thumbnail, a new browser window is opened and they are taken to that images's detail page on MediaFocus's site. This is where the user would make their image licensing purchase with their own account and their own payments. All purchasing communication is between the user and MediaFocus and you are out of the loop. With this option, there will be no further option to select. Click Save to save all your settings and then click on the "Your Code" tab to get the integration code. Show Image Detail page on my site. With this option, when the user clicks on an image thumbnail, they will be taken to the image detail page for that image on your site. There the user will see a larger, unbranded preview image as well as that images's keywords. They will also see all the sizes available for that image limited by your pre-filters settings for Size, if you had set up any. At this point, the user still remains on your site. Redirect to MediaFocus Image Detail page. MediaFocus will conduct all transactions. Similar to the first option "DO NOT show Image Detail page ..." with the only difference being that the image detail page that the user sees first is on your site. All licensing transaction will still be between the user and MediaFocus and you are out of the loop. This option implements full integration with your site. 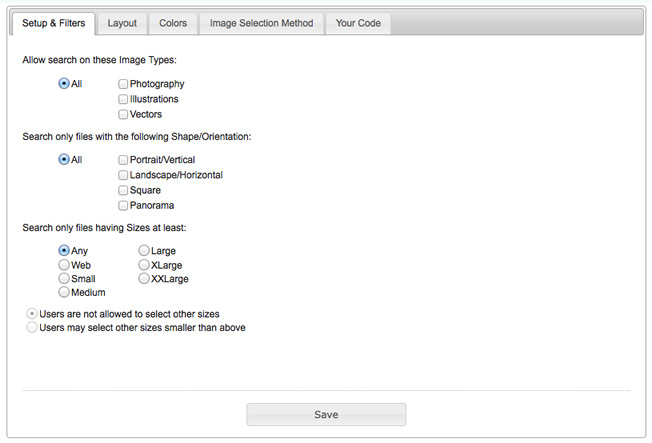 Here, your user will select the desired image size on the image detail on your site. After selecting the image size, the user will either receive a success "Thank You" message on the page, or an error message of something wrong occurs. The user always stays on your site. The image selected by your user will be licensed to you under your MediaFocus account. 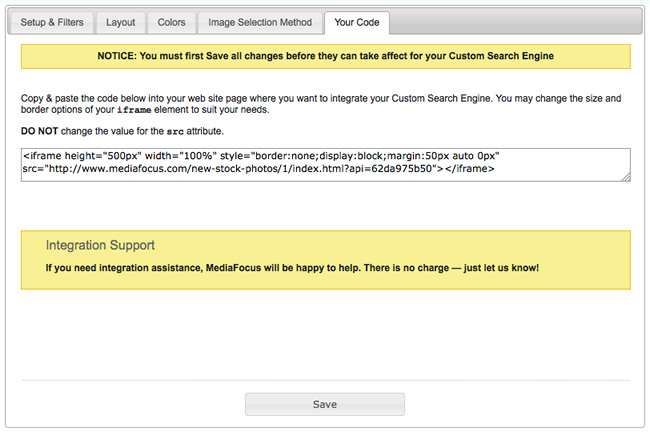 This requires that you validate your site and also have an active Image Subscription with MediaFocus in good standing. To be able to integrate user image licensing on your site, you must first verify that you have authorized root level access. To do this, enter your site's domain where you intend to integrate the Custom Search Engine in the field marked "Your Web Site Address". Then place an empty text file on your site with the name of your Custom Search API ending with ".txt" and click "Verify". If the MediaFocus back-end process is able to locate the api key file, then your site is verified, indicated by the word "Verified" in green next to the Site Address field. DO NOT remove this file once your site is verified. It is routinely accessed by MediaFocus to ensure continued verification. Full integration will allow your user to select the image size on your site and generate a download link to the email on your account. This requires an active Extended License Image subscription for the downloads to be credited against. If an active subscription is not found for your account of if the allotted images is depleted, the user will receive an error message indicating that their image selection could not be processed. In either cases of a successful or unsuccessful image selection, your will receive an email notifying you of the selection and the status. For successful image selections, the email will also contain a download link for the image. Click "Save" at any time to save your settings and site verification status. Then click on the "Your Code" tab. Simply copy the entire HTML code here into your web page where you want to use Custom Image Search. It's that easy! You are free to modify the width, height and style attributes to fit your site however you wish. However, you must not modify the value for the "src" attribute except for the "ref" value if you wish to include custom data that will be recorded with any image selection your user makes if you are using full integration. To help you better integrate your business with the Custom Image Search, you are able to include your own custom reference data from your system to be included each time you serve of the page containing the search to your users. This may include information such as customer number, order number or anything else you need to be able to reference an image download email to a user order. MediaFocus does not use this information in any way. It is simply included in the download email sent to you. This reference data cannot be larger than 50 characters and must be properly url encoded.